Less than an inch thick. Speaks the time and temperature at the touch of a button. Easily change from Fahrenheit to Celsius and back again. 5 different alarm sounds to choose from. Anti-slide soft silicone gel to enhance holding experience. This sleak new keychain is super cool. It boasts all the features you've come to know and love with our Talking Keychain Clock, with a couple of bonuses. First, as the title suggests, this unit speaks the current temperature in addition to the time, whenever you touch the Talk button. It even conveniently toggles between Fahrenheit and Celsius. Next, there are five different alarm sounds to choose from, to make waking up at least a bit more bearable in the morning. Finally, the body of the keychain is covered in a soft silicone gel, to keep the clock in one place and offer a rich feel as well. Comes with 2 Maxell AG13 batteries already installed. Directions for the Talking Keychain Thermometer From Future Aids, The Braille Superstore. Buttons. 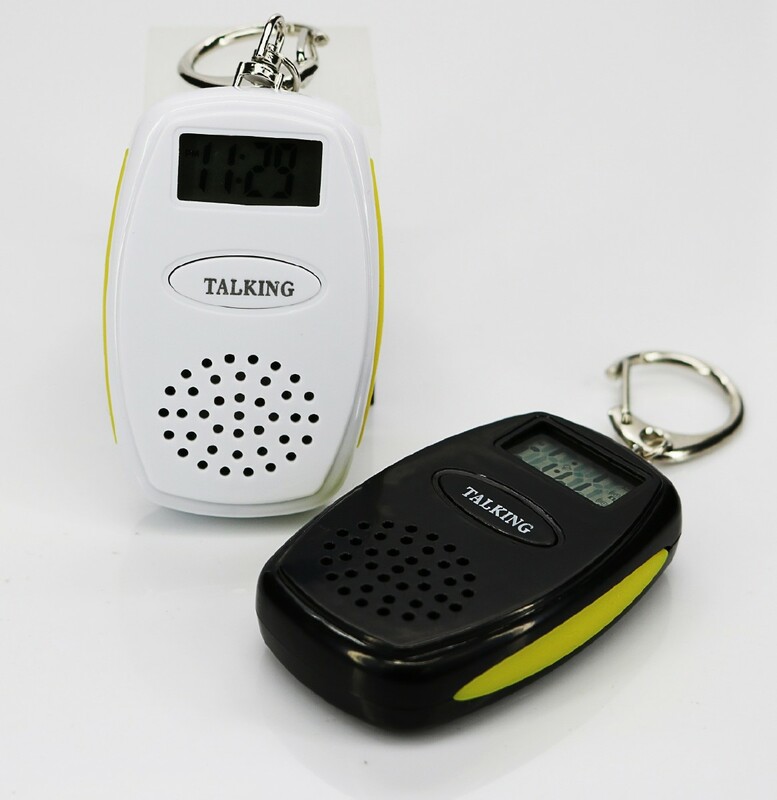 On the front of your new talking keychain, directly above the speaker, is the oval-shaped Talk button. On the back of the keychain, near the top, there are three buttons. To the left is Hour, and on the right is Minute. The Mode button is located between and slightly below Hour and Minute. Below the Mode button is the battery cartridge, where the battery can be replaced. Setting Time. Press the Mode button once to enter the time-setting menu. Press Hour and Minute until the correct time is spoken. Setting Alarm. Press the Mode button a second time. Press Hour and Minute until the correct alarm time is spoken. Setting Features. Press the Mode button a third time. Press Hour to toggle hourly report. One beep indicates time will be announced hourly, two beeps indicates clock will chime every hour from 7 AM to 9 PM, and no beeps indicates hourly report is off. Press Minute to toggle the Alarm. One beep indicates the alarm is on, no sound indicates the alarm is off. Normal Operation. Press Talk whenever you want to hear the current time and temperature. Press Hour to toggle between 12 and 24-hour format. A beep is heard when 12-hour format is selected. Press Minute to select your favorite alarm sound. Press and hold Hour for three seconds to switch between Celsius and Fahrenheit. When the alarm goes off, Press Talk to snooze for ten minutes, or press Mode to stop the Alarm.